Google Street View camera trucks have photographed something even better than the white Stig: a custom Aston Martin built for the Sultan of Brunei. Here is the story of how we found it. “I don’t have a clue,” is what I reply to my friend Máté’s illustrated letter. My reply is not exactly true. I do have the faintest of clues, not enough to base a reply on, but enough to get started. A pattern is vaguely recognized. As readers of Malcolm Gladwell’s first second book Blink will recall, after absorbing prodigious amounts of information, the mind is able—in situations related to the nature of said information—to make quick decisions based on apparently very little input. This is how professional tennis players react to a serve too fast to interpret, how racing drivers can run competitive laps on an unfamiliar track and how an excellent friend of mine can look at a brownish spot in the sky a thousand feet away and say it’s a Black Kite. An old female, to be specific. Zagato’s fluid yet butch lines stick to the brain like ground effect cars to the racing line. And while Máté’s Magic Mystery Aston had a whiff of Zagato about it, what it looked most like was a kit car. Can’t be, he says. “I happened to photograph it on the most expensive street in the world,” and he directs me to the Wikipedia page of The Bishops Avenue in London. Oh, that. The street you move to when you’ve made it, made it big, and you want the world to know about it. Zoned from a piece of land that used to belong to the Bishop of London, the Avenue has become a favorite spot of the nouveau riche, particularly if those nouveau riches have come from the likes of oil, guns and naked women. When Saddam Hussein invaded Kuwait in 1991, the House of Saud ruling neighboring Saudi Arabia snapped up ten of the Avenue’s 66 mansions. This is a street that used to be called Millionaire’s Mile, but which has lost that title to become Billionaire’s Boulevard. So yes, the Aston is probably real. One of the residents of The Bishops Avenue is Hassanal Bolkiah, the Sultan of Brunei, and this is when you can sort of expect a light bulb to go off in the automotive brain—not mine, unfortunately—because you all know what Hassanal Bolkiah does with his tiny fiefdom’s oil riches: buys all the cars in the world and then some. Our very own guide to the cream of his crop will help you along with a gray F40, a Lamborghini LM002 safari wagon and five Dauer Porsches. The latter are street legal Le Mans race cars from the turbolicious Group C of the 1980s which accelerate like ballistic missiles all the way to 250 MPH. 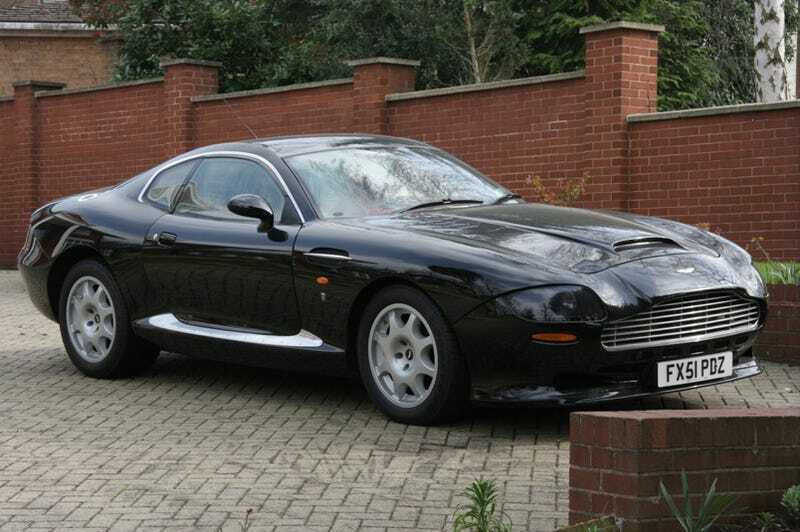 A significant portion of Bolkiah’s fleet was not purchased but built, and alongside the Ferrari sedans and shooting brakes is a set of three Aston Martins from 1997 called the V8 Vantage Special Series I. They are based not on the current V8 Vantage but the bigger car with the same name produced in the 1990s and they look exactly like the DB4 GT Zagato of 1961, only bigger. Apparently, the Sultan likes his supercars the 60s way. But coachbuilders are not exactly fond of reproducing earlier designs atop modern machinery. And through another flutter of Bolkiah’s bottomless wallet, the Zagato people got to work again on the V8 Vantage, operating this time not as the codex copiers of Mediaval Europe but as coachbuilders. What they came up with was the V8 Vantage Special Series II, a modern, very Zagato, thoroughly menacing Aston: the car Máté photographed. Wicked performance is suggested by those curves and the Series II doesn’t disappoint: its 5.3-liter twin-supercharged V8 makes 600 HP and can launch the two-ton coupé to sixty in 4.4 seconds. The aerodynamic wall arrives at 205 MPH. Zagato built a total of three cars, two for Bolkiah, one for his brother Jefri. This is where the story would normally end but just as Máté confirmed his haunch with a link to Supercars.net, Google unveiled Street View for London. I raced for a large screen, hooked it up to my Mac, and spent an hour and a half combing the length and breadth of The Bishops Lane to no avail. I found a lone Ferrari F430 but looking for custom-built Astons has a way of turning production Ferraris into Crown Victorias. So on to you now, Street View ornithologists. Descend on London and dig for cars with stories. And yes, I want my photo of the TVR Cerbera Speed 12.